I also keep a small notebook at hand because it seems that traffic jams bring great recipes to my mind – it was on a very rainy and chaotic day that I remembered the peanut butter cake with chocolate glaze from this wonderful book , and now it is here so you can try it too – it is oh, so delicious. Preheat the oven to 180°C/350°F. Grease a 12-cup Bundt pan and dust with flour. Whisk together the yogurt, eggs, and vanilla in a large glass measuring cup. Whisk together the flour, baking powder, baking soda, and salt in a medium bowl. Combine the butter, peanut butter, and demerara sugar in a large mixing bowl and cream with an electric mixer on medium-high speed until fluffy, about 3 minutes, scraping down the sides of the bowl once or twice as necessary. On low speed, alternately add the dry ingredients in 3 additions with the yogurt mixture in 2 additions, beginning and ending with the dry ingredients, scraping the sides of the bowl between additions. Turn the mixer to medium-high speed and beat for 1 minute. Scrape the batter into the prepared pan. Bake until golden and risen and a skewer inserted in the center comes out clean, 40-45 minutes. Let the cake cool in the pan for 10 minutes, then invert it onto a wire rack to cool completely. Glaze: heat the cream in a small saucepan over medium heat until it comes to a boil. Remove from the heat, add the chocolate and butter and let stand for 5 minutes. Whisk until smooth. Pour the warm glaze over the cake. 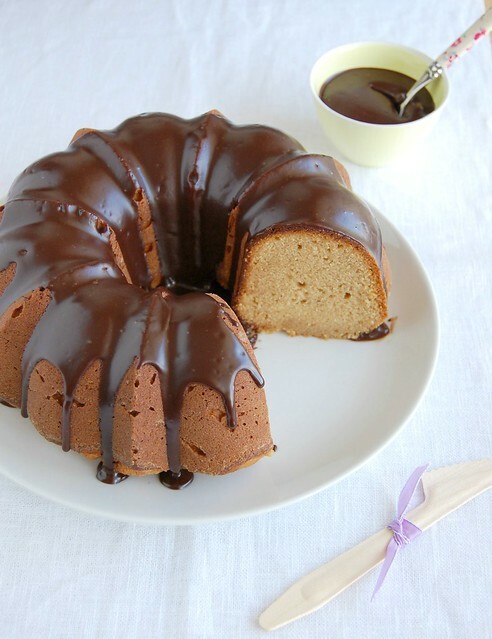 Love peanut butter with chocolate, a beautiful bundt! Cake looks beautiful!! Came here from tastespotting.. You have a nice space here. The cake look so fabulous. Hope you will continue to bake more cakes from this book. I just love PB and chocolate! This looks delicious. This looks rich and beautiful! Patricia you have an amazing blog!!!! This cake looks so delicious! You have a new follower today! Such a fabulous and super tempting cake. Wow! It look amazing!! Thanks for sharing, I love your blog!